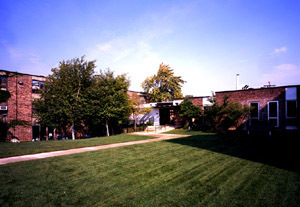 Interfaith House is the Midwest's first health recovery center. This sixty-bed respite program provides homeless persons discharged from area hospitals with the medical care and shelter they need to continue healing. Interfaith House uses the recovery period as a window of opportunity to introduce patients to programs that will help them regain a foothold in the community -- an approach that reduces health care costs and hospital readmissions. Interfaith House was planned by Interfaith Housing and the Interfaith Council for the Homeless.